The FastFins® ethos is that teaching should be both instructive and inspiring and that learning swimming should be fun. Not in a flippant way, of course, but a positive, enjoyable pupil experience underpins the study of every discipline and swimming is no exception! FastFins® was founded in 2003 by Polish national champion swimmer Gabriela Rypinska-Grau MSc, who won numerous medals in national and European competitions. Our first-rate coaching methods have been formulated by drawing on the combined professional expertise gained over many years by Gabriela and her team of top international swimmers and teachers to create a robust and results-orientated programme. 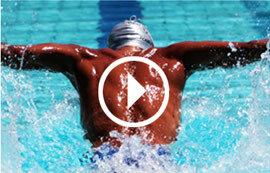 By virtue of accelerated learning, our swimmers fulfil their potential faster. Emphasis is placed on stroke technique, efficiency and stamina and all our pupils achieve the level of competence in swimming to which they aspire. The FastFins® modular learn-to-swim programme is highly-regarded in London. Our pupils are given a rigorous training regimen that enables many of our talented swimmers to graduate to some of the capital’s top swim clubs.